If you follow my twitter feed you’ll know that I recently took Nick Mamatas’ 9-week fiction writing class at the Writer’s Salon in Berkeley. It was really good. The next session is starting on October 9th. If you live in the East Bay (or San Francisco) and you are a writer who is as good as or worse than me and you want to become alot better, you should definitely take this class. Anyways, during the class, Nick mentioned several books that I was totally unfamiliar with. I not only had never heard of the books, I’d never even heard of their authors. 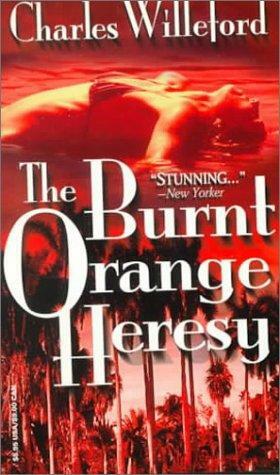 The books were The Killer Inside Me by Jim Thompson and The Burnt Orange Heresy by Charles Willeford. 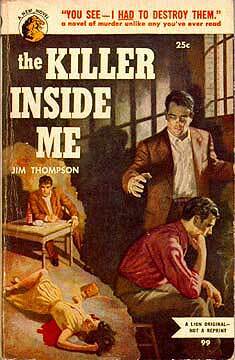 When I looked them up, Wikipedia said that they were “crime” novels and/or “noir” novels. The former is about a murderous deputy sheriff in a small Texas town; the latter is about a Florida-based art critic who gets a tip for a hot interview with a reclusive European artist who’s bunkered down in a nearby cabin. I read both books. And they were both awesome. But they left me confused. The two novels clearly shared some DNA. They were both first-person narratives starring amoral wretches who succumbed to temptation (and got their comeuppance in the end). They were both detailed, well-observed portraits of very small milieus. They both had a strong sense of setting. They were both fast-moving and gave short thrift to explanations. They both had structures that played around with narrative chronology (Thompson’s novel has frequent, quite long, background explanations and most of Willeford’s novel consists of an internal flashback). They were both quite short (around 40-50,000 words). And they were both unlike anything I’d read before. Clearly, I was dealing with a whole strand of American literature that I’d never encountered before. But I was (and still am) a little confused as to what that strand is. I am, after all, at least somewhat familiar with detective novels. I’ve read Hammett and Chandler. I’ve read Sherlock Holmes. And I’ve read novels about organized crime, like Mario Puzo’s works or Layer Cake. But these novels weren’t really anything like that stuff. There was no mystery or procedural element (although in Thompson’s book, at least, there was a question as to exactly how the killer would be caught), and there was no detective. In a way, the novels were like an adjunct to the mystery genre: the story of a crime as told from the criminal point of view. But they didn’t offer the same pleasures as mysteries. They didn’t hinge on any sort of revelation. Nor were they, quite, psychological novels. The criminal impulse was, in both cases, glossed over. In a way, it was seen as being somewhat obvious. Of course anyone in these situations would be driven to commit crimes…the only difference is that these guys actually did it. The major joy of the books was in seeing the consequences pile up. It was in seeing intelligent people thrash around against the limits of their environment and try, desperately, to outwit the almost insurmountable odds they were facing. The minor joy was in reading about the kind of people and the kind of places that aren’t normally the subject of novels. So I decided to investigate further, and conduct something of a survey of this kind of novel (which is, I guess “noir” literature…although that is a term that I had previously associated with Raymond Chandler’s detective stories). In assembling my reading list, I relied heavily on the Library of America’s two compilations of crime novels: American Noir of the 1930s and 40s and American Noir of the 1950s. In addition to these, I am currently planning on reading Jim Thompson’s Pop. 1280, Willeford’s Cockfighter, and Patricia Highsmith’s The Talented Mr. Ripley. It’s been a really interesting journey through noir literature, and over the next week or so, I hope to post more about what I’ve learned. But the biggest thing I’ve taken away from this experience is astonishment that I could have been unaware of something–a whole subgenre–that was (and to some extent, still is) a vibrant part of American literature. I mean, I know that it’s impossible to read everything, but I had thought, for some strange reason, that I knew–at least in broad strokes–about all the kinds of stuff that I hadn’t read. But clearly that was not true. I wonder what else I’ve missed? Welcome to it! There’s also a burgeoning noir short story scene you should check out! Really? Where would I find them? Are these the little crime zines you sometimes talk about on your blog? Yup. OUT OF THE GUTTER and NEEDLE are good on paper, SPINETINGLER and PLOTS WITH GUNS are good online. Great list and it’s hard not to just rattle off books and say, read this and this and this. You might want to check out Dorothy B. Hughes. I haven’t read her, but she was popular enough that Noir films got made from her novels (like “In a Lonely Place”). Also check out Willeford’s short fiction. Willeford’s stuff in “The Machine in Ward 11” walked the line between crime and horror at times. Sweet! I think I like Willeford the best, so I might check out his short stuff. If you were going to rattle off stuff, what would you rattle off? I love Willeford and would say read everything by him including his memoirs. Some of his 50s books can be journeyman work, but it’s all good, if that makes sense. Sadly, my rattling is not going to add too many authors only more books by the ones you’ve already read. Goodis’ Black Friday is a favorite as is Highsmith’s The Tremor of Forgery. Black Friday might be more approachable though as a noir. Tremor is more about a vacation that goes wrong. It also might be a decade or two after the 50s. There are lots of Highsmith short story collections out there, some arranged around themes like “The Book of Beastly Murder” and “Unnatural Catastrophes”. Her lesbian-romance thriller The Price of Salt would also be on my list, along with Strangers on a Train. Actually read everything by Highsmith including her writing book. One thing I find fascinating about Thompson and Himes is that both started out hoping to be literary authors. Early Himes is not noir but fueled by his experiences and time in prison. The stuff can be harsh, but worth reading. (Makes me wonder if Iceberg Slim and his novel Mama Black Widow ought to be on this list…). Early Thompson read more like the realist novels of the 30s, like the Grapes of Wrath, but mixed with American gothic. These books are good (Heed the Thunder) but not noir (closer to Steinbeck and Faulkner, maybe). For his noir fiction I’d add The Getaway (likable but ruthless sociopaths) and After Dark, My Sweet (honest to god, I consider this a noir version of Lassie). Thanks for this list. This is actually just the sort of thing I was looking. Just today I was looking for some kind of list that would tell me which of Thompson’s or Highsmith’s works to read next. It’s pretty hard to get a grip on authors who have large ouevres. Usually there’s one or two works that people have sort of decided are their “masterpieces” and then no real guidance on which of the other 20 works might also be worth reading. I’m actually planning on reading Shirley Jackson and Leiber’s Conjure Wife as part of another reading survey to shore up my (pretty minimal) knowledge of the horror genre. I saw this the other day and wanted to jump in, at least quickly. Noir is interesting because it is almost more of a strain of fiction rather then a sub-genre. In recent years a lot of authors have self-identified as a noir writer but even that can be misleading. My point I suppose is that it’s something that you have to kind of search for and not always find. And I guess that’s part of what makes a great noir story so rewarding. The other thing I wanted to say is that noir has been historically resistant to firm definition. Any attempt at defining what it is (and there have been lots) probably says more about the author of said definition then the term itself. I am one of the editors of Spinetingler which Nick mentioned above (thanks Nick) and we have an annual award and one of the award categories is “Best Short Story on the Web” which is meant to honor the online crime short fiction scene. This isn’t meant as self-promotion but you may find past nominees to be a good guide of some of the zines out there. Yes, I had noticed something like that. Athough the noir novels I read did have some similarities, their major connecting point was just that they were written by authors who were traditionally identified with crime magazines (or with crime movies). For instance, I was surprised to see Horace McCoy’s _They Shoot Horses, Don’t They_ being identified by the Library of America as a noir novel. If it had been written by Steinbeck or Sinclair Lewis, then it would certainly have a different genre appellation. In a similar vein, Camus’ The Stranger has many noir characteristics (as do Dostoevsky’s Crime and Publishment and Emile Zola’s La Bete Humaine), but as they came out of another tradition, I doubt they’re usually identified as noir novels. Of course, that’s how it is with every genre, but I agree that it seems like the definitions are even more tenuous with regards to noir novels, because there’s not much of a subject matter restriction. A noir novel can kind of be about anything. I’ve recently started thinking of noir literature as a strange sort of genre similar in odd categorization as horror. I interviewed Brian Evenson about this a while ago (interview linked below if you are curious). He said that horror is a unique genre in that it is defined by an intangible mood, rather than plot conventions. For example, detective novels must have a crime, a detective, and a sense of trying to solve the crime. Romance must have two people (or more) that love each other but are separated for some reason. But horror, the only convention is mood. Therefore, you can have a horror detective novel or a horror romance novel, no problem. I think the same is with noir. If you have a morally conflicted protagonist who ends a story as conflicted as he begins, with a focus more about the journey than any resolution, you can apply that layer to any other genre. I think there’s definitely something to be said for that. To a larger extent than horror (I think), noir is united by a common bunch of settings and tropes….but there’s also a sort of noirish mood…or a noirish worldview…alot of noir seems to take place in a dismal, garishly-lit place where people can imagine a better life than any of the lives which the book actually contains. I think you could definitely have a noir science fiction or a noir western or a noir campus novel (actually, Bret Easton Ellis kind of writes noir campus novels).